With a vibrant shade of turquoise complemented by a rustic dark brown border that lightens to a sandy brown, the Turquoise Sky and Earth Collection showcases a simple yet elegant design. Bringing to mind the tranquility and complexity of the sky in subtle varying hues of blue, this charming collection also features the gentle change in hues in the complementary deep brown around the rim that adds a unique touch to the design. Made in Japan and crafted from quality ceramic, the Turquoise Sky and Earth Collection features a beautiful high gloss finish that adds to the brilliancy of the blue. Unique crackled design adds visual texture. 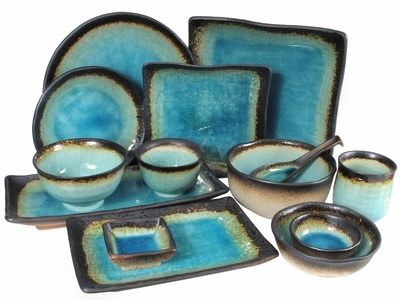 With gorgeous and unique dining ware pieces, the Turquoise Sky and Earth Collection is a fine addition for any dining room. Hand washing is recommended for the pieces in this collection.